“Financial Bid Opening of Housekeeping NIT with consent of the vendors is scheduled on Monday, 22nd April 2019 at 4:00 p.m. in the Conference Hall of Executive Guest House”. 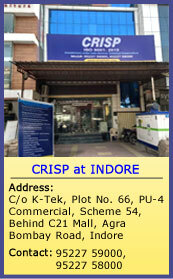 CRISP is an Autonomous Organization established under the Indo-German Technical Cooperation. Proposals are invited from experienced and reliable Housekeeping Service providers to provide the services of experienced peons, sweepers, gardener and drivers on monthly basis. Detailed requirements can be downloaded from our website: www.crispindia.com or collected from our office during working hours. Sealed envelopes containing the bids in the name of “CEO, CRISP” shall be received at the above address latest by 4:00 P.M. 15th April, 2019. The bids shall be opened at 3:00 p.m. on 16th April, 2019 in the presence of representatives of the bidders willing to be present there. The CEO, CRISP reserves the right to cancel the tender in full or part without assigning any reason.